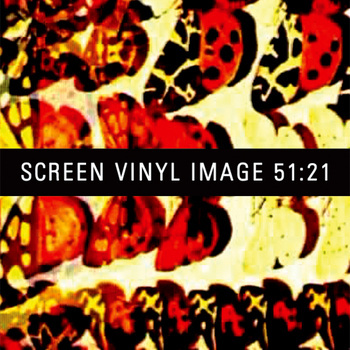 Something about Screen Vinyl Image is unambiguously vintage. It could be the name – its resemblance to the authentically ancient Ultra Vivid Scene. 51:21 opens with the immensely likeable ‘Too Much Speed’ – released as a single a couple of years ago if you were paying attention. A pleasantly noisy pop-tart with a tambourine and a hook, dancing with each other against a backdrop of fuzzy-coarse guitar noise that remains politely out of the way. Not quite so approachable is the aforementioned ‘Stay Asleep’ which features Gary Chadwick**. There is not a shred of doubt that this track was recorded around the time I was born (probably earlier). Cross the four minute mark and it’s the scene from Alien – an entirely new creature bursting out of a familiar character. Relentless (analogue) synths push their way out of the placid electropop and drill their way mercilessly into your subconscious. You’ll hear the echoes in your dreams, your veins will throb to the percussion and your ears will tingle with what may be white noise or may be tinnitus. Barring the closer, we’ve met the rest of these songs before, on The Midnight Sun EP, but they’re worth revisiting. These are the tracks you can see played live while you listen – lights swaying and melting into each other, voices soaked up by carpet and bouncing off concrete, heads bobbing or swaying, eyelids closing, bodies staying rigid. I’m especially fond of ‘Passing Through Mirrors’ – atypical, no doubt, it lacks the blackness of its comrades, its guitar is very nearly acoustic, it’s got ‘shimmer’ and ‘sparkle’ (are those chimes? ), it whistles and it coos, and before it can hypnotise us completely, it curls up into itself and slinks away, leaving us with the unforgiving intro of ’16mm Shrine’ to jolt us back into the dark. Thinkpiece? Jam session? Composition? Who knows what ’51:21′ was meant to be but its 32 minutes are what take up the 51:21 (51:59?) it’s named after. Live and unedited, it’s whirlpool synths, marching beats, metallic echos, a racing pulse, and even some 8 bit ideas. Our alien friend from ‘Stay Asleep’ also makes an appearance around the 25 minute mark, this time with a classic reverby ‘gaze guitar serving as its foil. If I had been more timely, I’d have been able to lead you to their bandcamp page so you could pick up 51:21 in Ye Olde Cassette Formatte. Now, however, you’re left with no choice but to direct venomous curses at me as you grudgingly download the digital album.